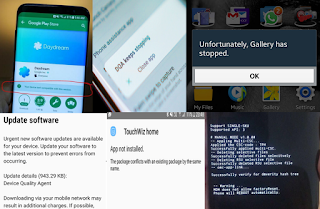 Error Message on Galaxy S8 Problems - The error messages Galaxy S8 problems appear on display made user confused what happen on new Samsung phones. 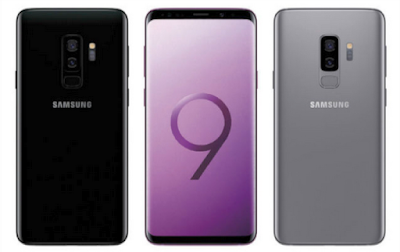 We already have a major update of the operating system available for the Samsung Galaxy S8 and Galaxy S8+ devices to fix the problems. Free some memory by transferring files to a computer or deleting files from your device. Restart the device or Reset Galaxy S8. If you are still having trouble with the camera app after trying these Galaxy S8 tips and tricks, contact a Samsung Service Centre. The quality of your photos may vary, depending on the surroundings and the photography techniques you use. If you take photos in dark areas, at night, or indoors, image noise may occur or images may be out of focus. Ensure that the music file is not Digital Rights Management (DRM)-protected. If the file is DRM-protected, ensure that you have the appropriate licence or key to play the file. Ensure that the file formats are supported by the device. If a file format is not supported, such as DivX or AC3, install an app that supports it. To confirm the file formats that your device supports, visit www.samsung.com. Your device supports photos and videos captured with the device. Photos and videos captured by other devices may not work properly. Your device supports multimedia files that are authorised by your network service provider or providers of additional services. Some content circulated on the Internet, such as ringtones, videos, or wallpapers, may not work properly. Ensure that the USB cable you are using is compatible with your device. Ensure that you have the proper driver installed and updated on your computer. If you are a Windows XP user, ensure that you have Windows XP Service Pack 3 or higher installed on your computer. Delete unnecessary data, such as cache, using the Galaxy S8 Smart manager or manually delete unused apps or files to free up storage space. The Apps button does not appear on the Home screen. 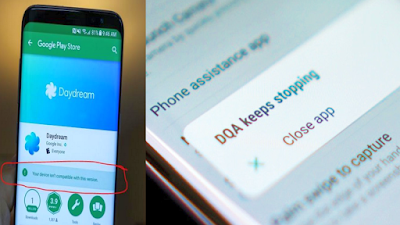 Without using the Apps button, you can open the Apps screen by swiping upwards or downwards on the Galaxy S8 Home screen. To return to the Home screen, swipe upwards or downwards on the Apps screen. To display the Apps button at the bottom of the Home screen, launch the Settings app and tap Display → Home screen → Apps button → Show Apps button → APPLY. features. To view the navigation bar, drag upwards from the bottom of the screen. Ensure that nothing obstructing the iris recognition camera and LED and try again. If light conditions are very different from when you registered your irises, the device may not recognise your irises. Move to another location and try again. Ensure that the device is not moving or tilted too much. 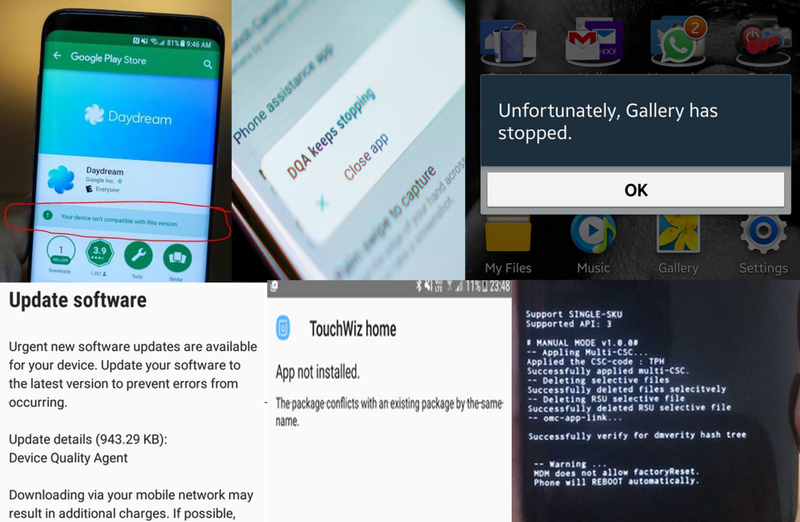 Update your Galaxy s8 software via the firmware over-the-air (FOTA) service. You can also schedule software updates. On the Settings screen, tap Software update. If emergency software updates are released for your device’s security and to block new types of security threats, they will be installed automatically without your agreement. 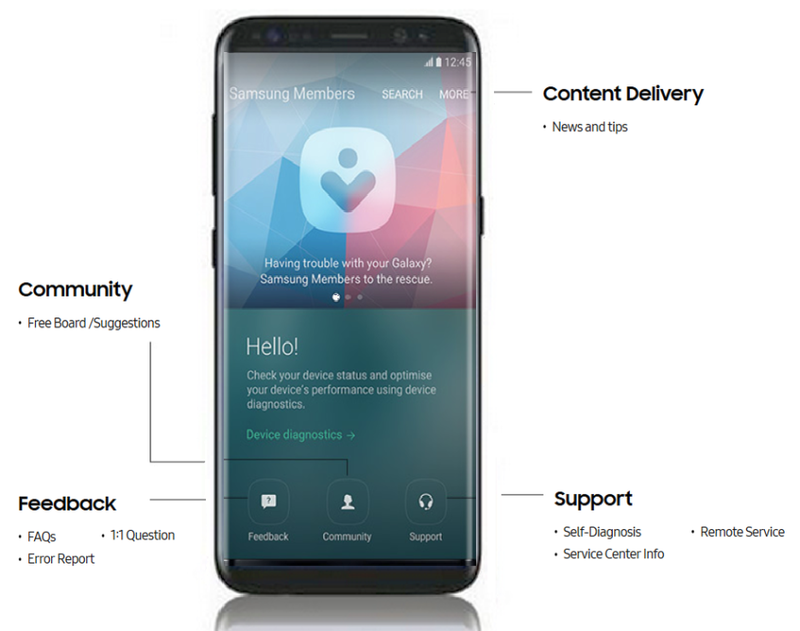 Samsung Members offers support online services to customers, such as device problem diagnosis, and lets users submit questions and Galaxy S8 error reports. 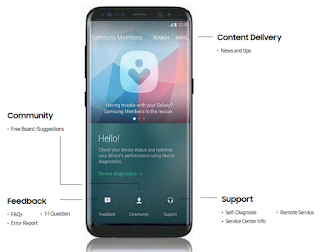 Samsung Members keeps your life uncomplicated by offering the services you need from Galaxy-related tips to solving problems in one easy-to-use app. You can also share information with others in the Galaxy users’ community or view the latest Galaxy news and tips. Galaxy S8 Online Support can help you solve any problems you might encounter while using your device. This app’s availability and supported features may vary depending on the region or service provider. To submit your feedback or post your comments, you must sign in to your Samsung account.